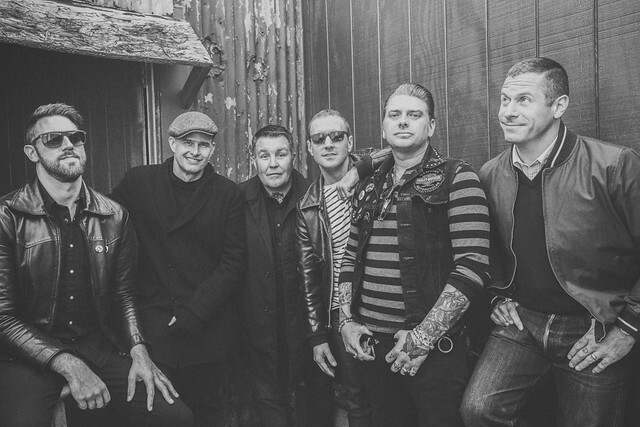 Of course, Dropkick Murphys consist of Al Barr (lead vocals), Tim Brennan (guitars, accordion, mellotron, whistles, vocals), Ken Casey (lead vocals, bass guitar), Jeff DaRosa (banjo, bouzouki, mandolin, harmonica, acoustic guitars, vocals), Matt Kelly (drums, percussion, vocals), and James Lynch (guitar, vocals). The band focused a lot of its energy recently on The Claddagh Fund, a charity it established in 2009 to help support addiction recovery as well as organizations that assist children and veterans. That work influenced the songs on 11 Short Stories of Pain & Glory, which debuted at #8 on the Billboard Top 200 albums chart (and it was the #1 independently released album). The gents personally have been raising funds, mentoring, and helping where they can to support the charitable causes of The Claddagh Fund. And so, the songs reflect their experiences in that work, depicting their sadness, anger, and dismay at the US opiate epidemic but also their pride in those who have recovered and started their lives anew.